We have a book blog here so obviously we love books… but another thing Erica and I noticed in the community is the love of Netflix (or binging TV shows in general). We wanted to include both of those in a challenge for the year of 2017, which led to… the Netflix and Books Challenge! We previously put together the Netflix and Books Tag that people seemed to enjoy, so we already had some pretty great ideas in place to take it one step further. 😉 This will be a year-long challenge held by Erica from Novel Ink and me! What exactly is the Netflix and Books Challenge? This is going to be a yearly challenge focused on watching television shows we’ve been wanting to get to (both new and old), and reading books we’ve been wanting to read that match some fun challenge prompts. If you choose to, you’ll have the chance to earn points throughout the year (thank you Aentee from Read at Midnight for allowing us to use her point system idea!). The first level of the challenge is to simply make a TBR list and TBW list (to be watched) and then link it up with us here. You’ll see prompts below that describe certain book and TV settings, plot points, tropes, time periods, etc. Develop a TBR list based on those prompts and see how many you can actually read in 2017. Then, share some TV shows with us that you plan to watch in 2017 as well. 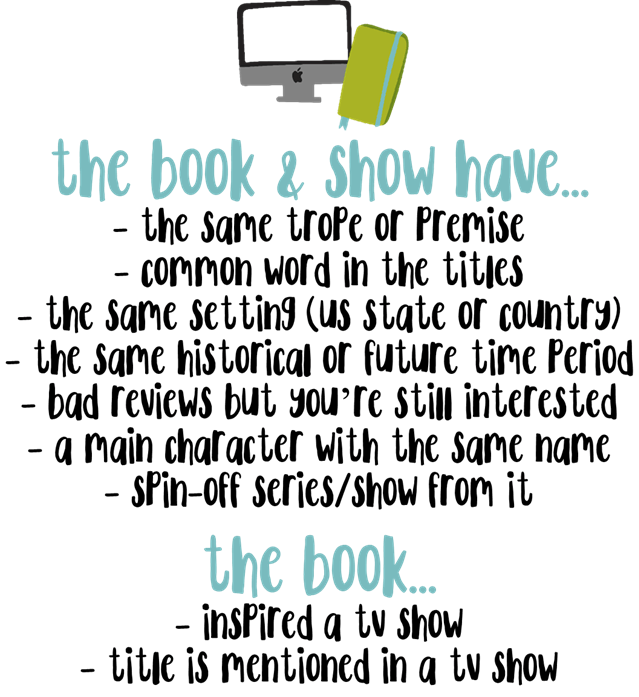 Please note that TV shows don’t have to match with the books you read for the prompts; they can just be a list of shows you hope to start and/or finish! We’re curious to see what you all have planned for reading and watching in 2017! Make sense? Here are some more specific examples for each category so you can see what we’re thinking here. You basically draw comparisons between the books you read and TV shows that exist. 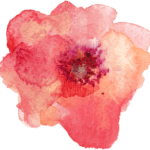 You will get a entries into a giveaway for linking up now AND linking up progress each month, if you’re so inclined. You can treat it just like a regular reading challenge with monthly check-ins, but this will feature shows AND books. See everything above in level one! 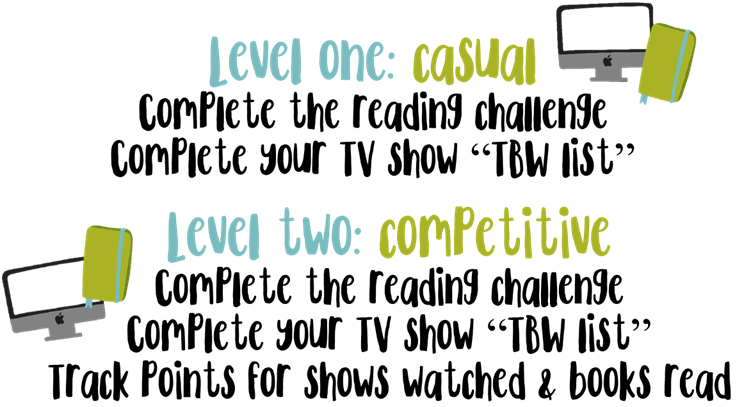 You have to complete that first part in order to participate down into level two, if you’re a competitive person who likes to earn points 😉 The biggest thing about level two is that you earn points for books you read that match our challenge prompts, and then points for banging out some TV shows in general. You will get bonus points IF a show you watch in 2017 actually does match up with a book for the prompts above. For example, if I watch Revenge and read The Revenge Playbook (a book with the same word in the title as a TV show), I will get a point bonus. Because I read the book AND watched the show in the same year, I’ll get 25 bonus points for each show+book combo I am able to match up. You can earn points by completing our Netflix and Books Tag too! If you have previously completed it you can add a lovely 20 points to your total right off the bat. If you do it in 2017, you will still get the 20 points. Just post a link to that in one of your wrap-ups. You can keep track of points by doing weekly or monthly wrap-ups (we suggest a monthly one). Whether it be on your blog, Twitter, Instagram, or wherever – as long as are able to track it and it is a social media platform. Just update on far along you are on certain shows or books. You can use the hashtag #NetflixBooks2017. We want to point out that you don’t have to keep track of points if you don’t want to. It is NOT mandatory. You’re able to link up TBR and TBW lists and track everything each month, like you would with any other reading challenge. However, the person with the highest amount of points at the end of the year will win a prize, assuming no cheating has occurred. We will also be holding a giveaway for people who participated in the first level of the challenge too. What do I include in my sign up post and how do I sign up? In your sign-up post you can include some TV shows you are wanting to watch (your TBW) and you can make a list of the books you want to read (your TBR). This can be tentative as we know sometimes our moods change and we watch different shows. Plus, some new shows will be coming out in 2017 and you can’t predict the future (or can you? Now, that would be ah-mazing). Anyway, just write up a post and say what you are wanting to watch and read. You include any other information you may want. No boundaries, really. Link up at the bottom of this post, under the sample sign-up below. Feel free to use our graphics and header image in your own posts! Okay, SO! Here is my projected TBR for the challenge, as well as how many points I’m aiming to earn from both reading books and finishing up some TV shows. Luckily I recently put together some Fall/Winter TV plans – that I’m currently failing at – so it helped guide me in choosing some shows. You can set up your TBR and TBW lists similarly to this if it helps you out. I picked one book for each category to match a TV show I’ve watched in the past or am currently watching. I had all of these books on my general 2017 TBR so I’m excited I found some shows and categories to match them with! You can see how they’re connected underneath each category. 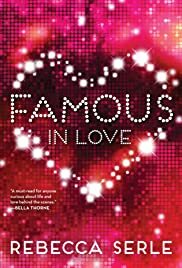 Connection: reality TV trope, rich and famous people, etc. 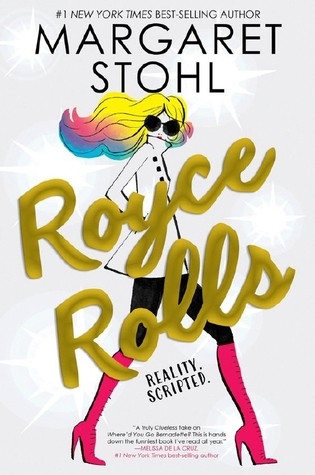 I think the premise of this book – reality TV family goes through troubles and their show needs to be saved – does a nice job of coordinating with KUWTK. I’m not a huge fan of the Kardashians but I respect how they were able to make fame and success from something pretty negative haha. Definitely can see the connection there! I’m still working through GG but I know Rory reads a lot of books. There’s a list of 300+ books they reference throughout the show! 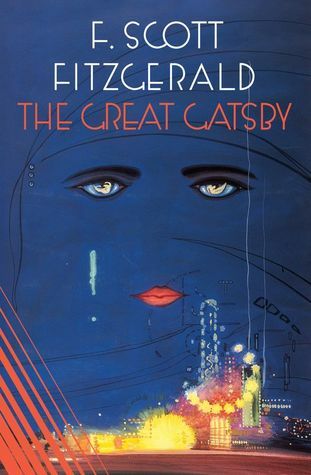 I’d been planning to reread Gatsby sometime in the next year or so, then I found the audio on Hoopla today. Win-win situation here, so I can reread it and connect it for this category. I’m soooo excited for the final book in The Falconer trilogy! 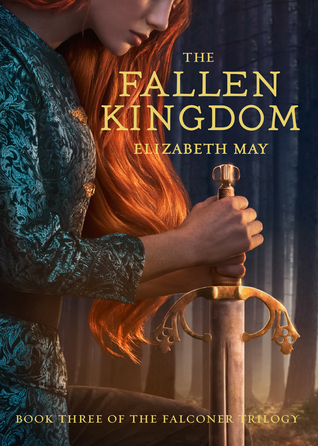 It also just so happens that the word “kingdom” is in the title. 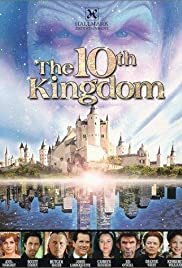 I’m watching The 10th Kingdom (slowly but surely) and will continue through 2017. There are only 9 or 10 episodes but they’re each 1.5 hours long, so it’s like sitting down for a movie each time. So good though! Another series finale for this one! 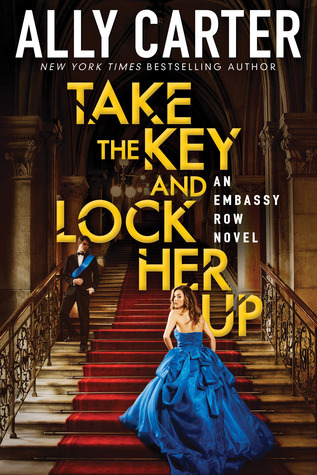 I’ve really enjoyed the Embassy Row series so far and can definitely count on Ally Carter to finish strong. 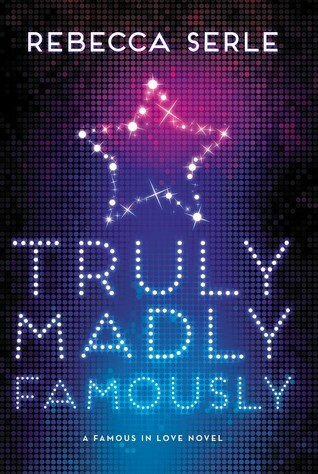 The main character in this trilogy and in the TV show Will & Grace is named Grace. 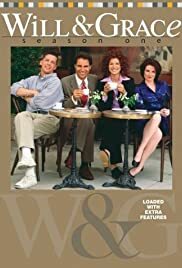 I’ve also been planning a W&G rewatch at some point but I have no idea when. Such a fun show. 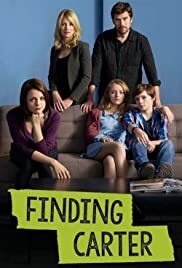 I don’t remember where Finding Carter takes place in Virginia, but I know that the TATBILB trilogy (eek! trilogy!) takes place in Richmond. 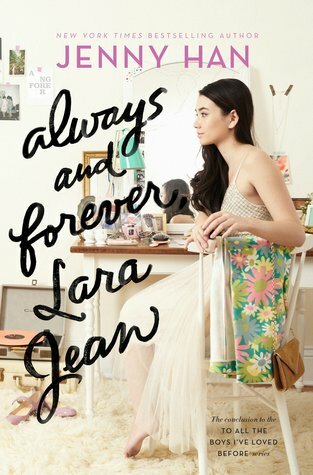 I’m so excited to read this surprise book from Jenny Han. Finding Carter is also on my watch list because I saw like 10 episodes forever ago and want to finish up. I read the first book in the series a year or two ago and honestly? I wasn’t overly impressed. That doesn’t mean I’m not going to watch the TV show or finish the series… because I totally am. The show looks really intriguing (and maybe a little different than the book?) and the second book will probably annoy me. But, you know… YOLO. I was on a huuuuge Sailor Moon kick earlier this year but I’ve been so bad about watching. I’ve been watching the dubbed versions and pretty soon (season 3 I think) I’ll have to switch to subbed. Not ready. 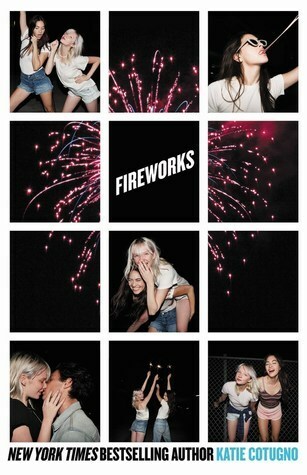 Honestly I LOVE this show and get addicted whenever I watch… but I never press play for some reason. Maybe I just gravitate towards lighter TV shows and comedies lately? I can’t wait to finish though. I watched episode one last week and haven’t watched another since. It’s not because I didn’t like it – I totally did. I just haven’t had the time to keep up with it this week. Plenty of time next year! 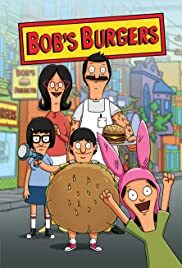 I’ve seen so many episodes of this show over time but I haven’t sat and watched from start to “finish.” Luckily there are more episodes coming all the time, but my goal is to catch up through the current/recent season. And that’s it folks! Hopefully my sample TBR & TBW helped! Sign up below with the linky! I love this challenge! I barely spend any time watching tv because I usually just stick to reading and YouTube. And PS the new dubbed version of the first half of season 3 of Sailor Moon recently came out so you have more time before switching to subs!! I always have shows where I’m like “I NEED TO WATCH THIS” and I just never get around to it. So hopefully this helps! 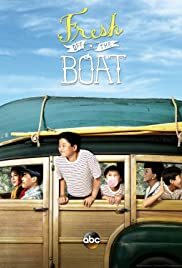 I had no idea Fresh Off The Boat took place in the 90s! That’s awesome, I really want to watch. And this is a super fun challenge! Love how you paired up your books and tv shows. 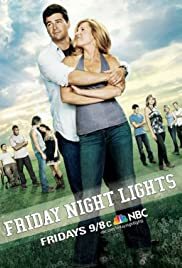 Yesssss FNL! Keep going 😉 Can’t wait for The Falling Kingdom too, it’s going to be intense! Well this is awesome! Quick question, can we include manga/graphic novels on our TBR? And how do anime <30 minutes fit in with the points? Hi there! Yes, I’d say graphic novels can count as long as they’re over… 125 pages? I think that’ll work! I love this! I’m going to try to participate! Do movies count or just Netflix shows?? I’ve read through the rules multiples times, but I’m still a bit confused and wanted to clarify. 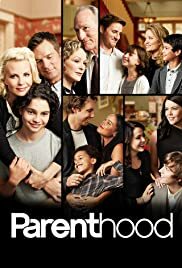 For Title Mentioned in Show, can I match up the same show multiple times, but with different books? Or can you only do a category more than once, if you have new matches for both book and show? 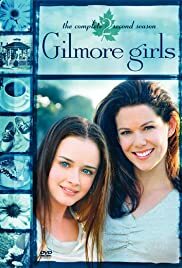 For instance, Gilmore Girls mentions a few titles on my TBR – if I read them this year, can I match them up with Title Mentioned in Show – as long as the books aren’t mentioned in another category? Or is that a no no? You can do a category multiple times only if you have new shows and new books for it. 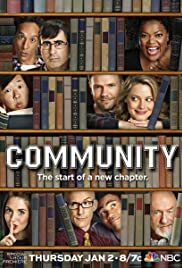 So, you could do “title matched in a show” for one book paired with one show, then ANOTHER book paired with ANOTHER show. Enjoying this challenge so much with The Unbroken Line of the Moon and Vikings. Where had Johannesburg Hildebrandt been hiding and why did I wait so long to check out this series?! Thank you Lauren! Haha I hope you enjoy the challenge!! If you complete the first level, do the books and shows you’ve read/watched count in level two? Or do you start from zero? Yes, basically level two builds off of level one! If you’re going to do level 2, anything from level 1 is included in that. Ok, I’ve finally put my list together, and I’m officially signed up! This is such a creative challenge – I look forward to making my way through it! How would you count 40 minute shows? Would you round up or down?